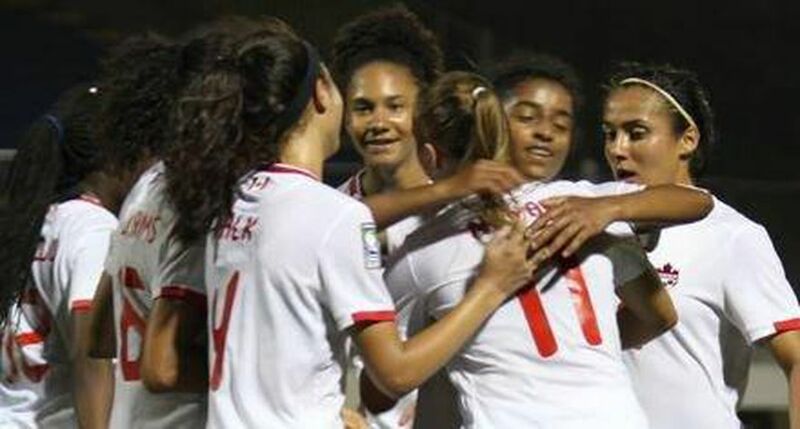 BRADENTON, FLA. — Calgary forward Andersen Williams scored in the 89th minute to send Canada to the FIFA U-17 Women’s World Cup later this year with a 2-1 win over Haiti on Tuesday in the third-place game at the CONCACAF Women’s Under-17 Championship. The goal came off a Julianne Vallerand corner. Captain Jordyn Huitema, positioned at the far post, headed the ball back and Williams rose high to head the ball low to the corner past the Haiti ‘keeper. Haiti players dropped to the ground as Canada celebrated the winning goal. Huitema’s 48th-minute goal had given Canada 1-0 lead. But Haiti star Melchie Dumornay tied it up on a 75th-minute penalty. The top three teams at the eight-team CONCACAF championship advance to the FIFA-17 championship Nov. 13-Dec. 1 in Uruguay. Mexico and the U.S., who met in the championship game later Tuesday, had already qualified. Canada also advanced at the expense of Haiti last time out, winning 4-2 in the third-place match to make the 2016 FIFA U-17 World Cup in Jordan. Haiti had beaten the Canadians 2-1 in preliminary-round play. The third-place game kicked off at 10 a.m. local time Tuesday but there was little respite from the Florida heat with the 28-degree Celsius conditions feeling more like 38 degrees at the IMG Academy. Caitlin Shaw set up the opening goal with a long pass from just inside the Canadian half. The ball split the Haitian defence and Huitema beat the goalkeeper from just outside the box. Dumornay, who does not turn 15 until August, was Haiti’s main offensive threat. She won the penalty when she was taken down by Anna Karpenko as she looked to round the Canadian ‘keeper. Dumornay then beat Karpenko with a low shot to the corner from the penalty spot. Dumornay had come close in the 68th minute but her shot, after a nifty turn to lose a defender, hit an onrushing Karpenko and trickled just past the outside of the post. Dumornay forced a first-half save from Karpenko at the side of goal before firing a free kick just wide. It was 0-0 at the half. Canada had 62 per cent possession but put just one shot on target compared to two for Haiti. The competition started in April in Nicaragua before CONCACAF, the governing body of soccer in North and Central America and the Caribbean, pulled the plug after just six games due to violence in Managua. The tournament resumed in Florida with just six teams, given Puerto Rico and Nicaragua both lost their first two outings and were eliminated from advancing to the semifinals. Canada went 2-1-0 in the preliminary round, defeating Bermuda 3-0 in the Nicaragua portion, before losing 2-1 to Mexico in the semifinals. Haiti lost 3-2 to the U.S. in the other semifinal after going 2-0-1 in group play. Since suspension of the Nicaragua tournament, FIFA has held the draw for the Uruguay U-17 World Cup. Canada, as the third CONCACAF qualifier, will play in a pool with Cameroon, Germany and North Korea. The CONCACAF champion will play in a group with Brazil, Japan and South Africa while the CONCACAF runner-up is grouped with Colombia, South Korea and Spain. Canada had qualified for all five previous editions of the U-17 World Cup, making the quarterfinals in 2008, ‘12 and ‘14. Correction: June 13, 2018: This article was edited from a previous version that misstated the dates of the FIFA-17 championship in Uruguay, Mexico and the U.S. as Nov. 31- Dec. 1.